A Pure White Heart bedecked with a bright red rose. 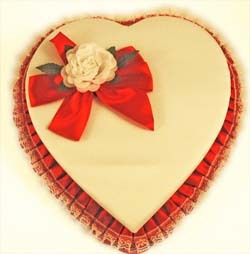 Fit for the Queen of your heart.... Loaded with delicious Dorothy's Delux assortment. Dimensions: 10" x 9 1/2" x 1 1/4"